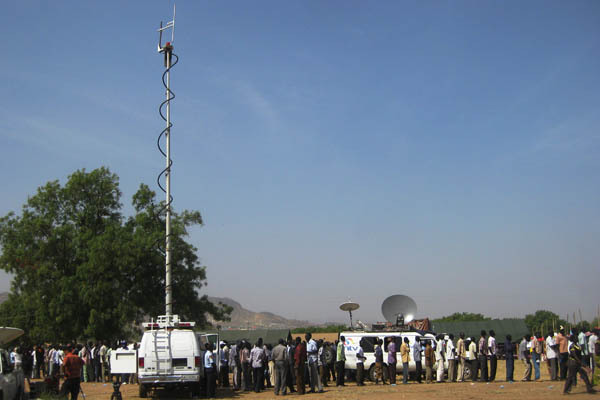 Working in a coordination office for a humanitarian organisation, rather than in a field site, has its drawbacks. 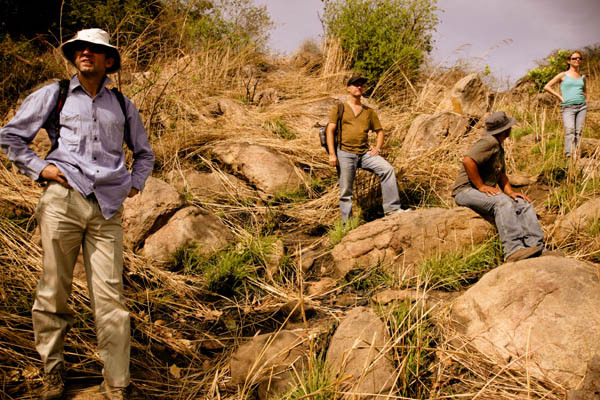 Away from the action, it can be difficult to understand the needs of the field sites, to feel connected to the actual work being done by the organisation. This is true of coordination offices in Europe and North America, where most international NGOs have their head offices, and of in-country coordination offices. 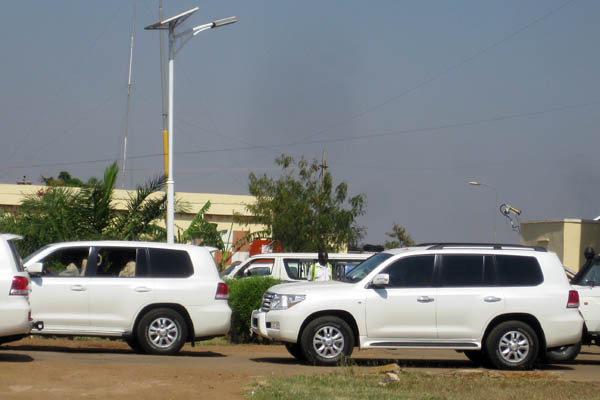 The latter can be found in cities like Goma, Juba, Bangui, Kabul, Port-au-Prince, and others, where the streets are rivers flowing white with the Toyota LandCruisers and Nissan Patrols of dozens, if not hundreds, of NGOs and UN agencies. Noise, traffic, high cost of living, and pollution are among some of the negative things encountered in many of these cities. At the same time, the cities that host humanitarian coordination offices also tend to have restaurants that serve pizza, burgers, steak, and other tasty but not-at-all local cuisine. A BLT by the pool? An espresso on the veranda? A dinner by candlelight on the banks of the Nile? A cold Leffe on the shore of Lake Kivu? 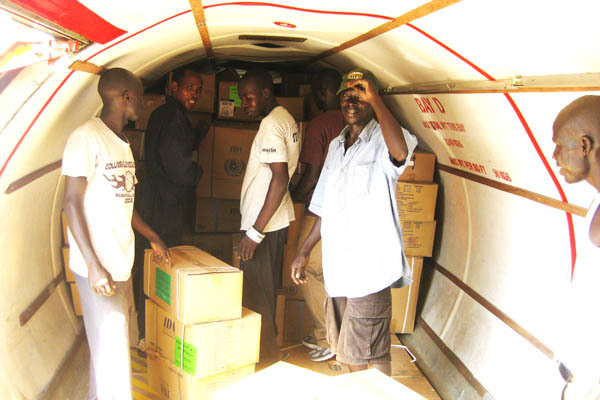 All these and more can be yours, if you’re a humanitarian aid worker “stuck” in a coordination office. 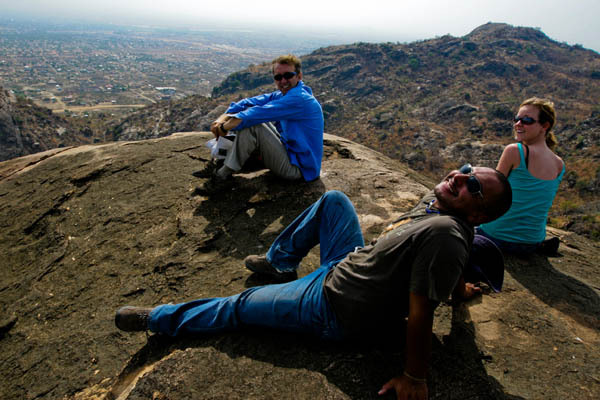 While I personally would much prefer to spend most of my time in the field, it’s not exactly easy to complain about working in a coordination office when the living conditions are so cushy. 0641: Wake up on the sofa of a friend, after a big party at one organisation’s residence. 0652: Get up from the sofa, groggy and mosquito-bitten all over, clothes reeking of other people’s cigarette smoke from the party. 0705: In the car and out the compound gates with two other friends. 0715: Arrive at an agency’s guesthouse to pick up two more people. Notice one of the car’s tires is low on air. 0740: Leave the guesthouse with everyone on board, and one nearly flat tire. 0749: Arrive at my house to change into shorts and pick up my dSLR. 0802: Leave my house, still searching for a place to put air in the tire. 0814: Pull over at a gas station. No air for the tire. Pull back onto the dirt road. 0818: Successfully re-inflate the tire and continue on our way, five people crammed into a tiny little two door car. 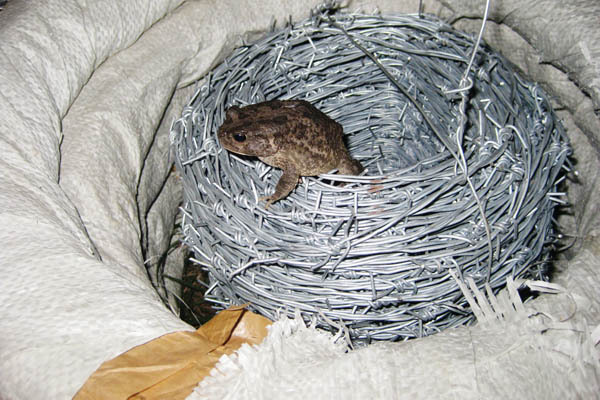 0840: Arrive at Jebel Lodge to meet our friend, but can’t find her anywhere. 0842: Head toward another agency’s residence nearby to find her. Can’t find the way in, drive back and forth for 5 minutes to the amusement of the children living nearby. 0855: Find the house where our friend reportedly lives, knock on the door. Girl with same name but different face answers the door, says the girl we’re looking for is in House 16. 0857: Drive away in search of House 16. Locate House 16, drive up the sidewalk toward the front door. 0900: Knock on the door, hear the grunt of a hibernating bear. Fear for lives, return to car, reverse car down the sidewalk back to the road. 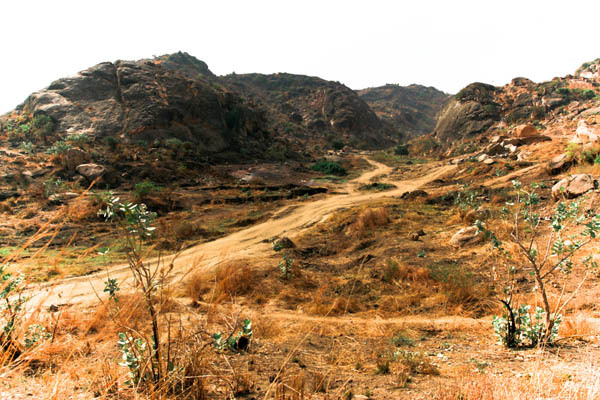 0904: Head back to Jebel Lodge to park the car, having given up on finding our friend. 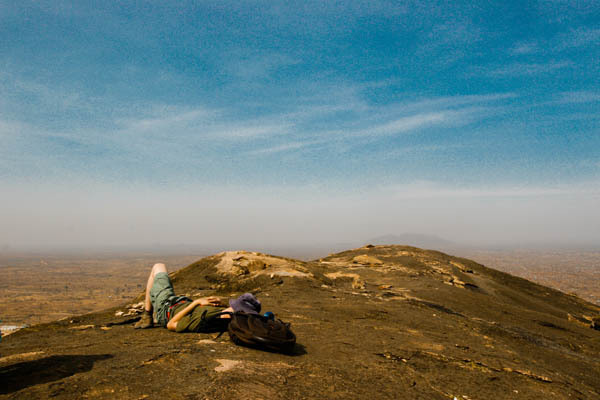 0925: Begin the walk up Jebel Kujur, the mountain rising out of the plains to the west of Juba. 1025: Lie down to sleep. Allow others to take photos with my dSLR. 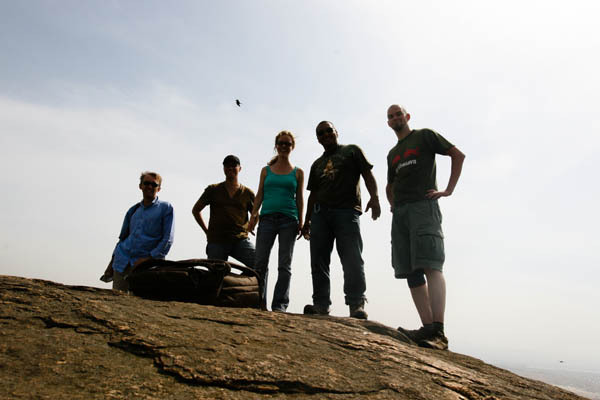 1050: Start the hike back down the mountain. 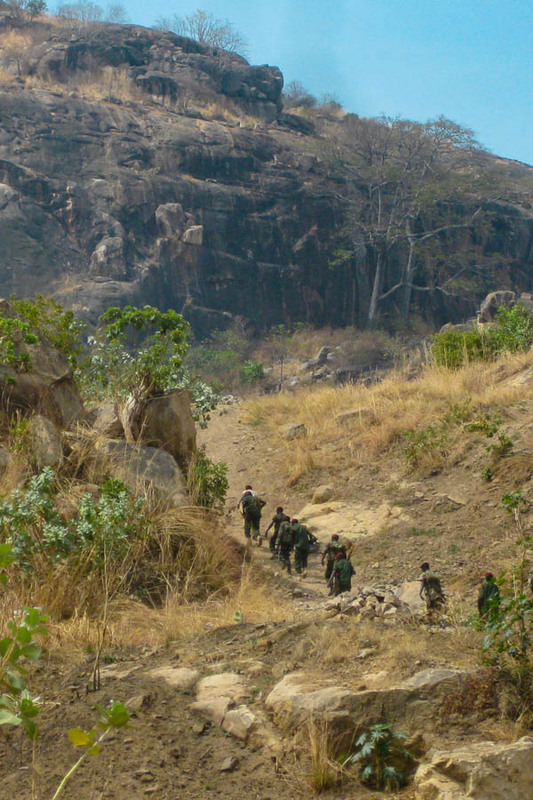 1112: Walk past a dozen very heavily armed special forces soldiers, accompanied by a khawaja of some assumed importance and another khawaja with a news camera, who apparently felt it a good idea to climb up a mountain at midday in 40+ heat. 1130: Arrive back at Jebel Lodge. Order a soft drink, down it quickly, then order another. 1133: Sit down under a shade umbrella by the pool. Order a BLT with fries. Drink first coffee of the day. 1153: Eat BLT sandwich, order another soft drink. 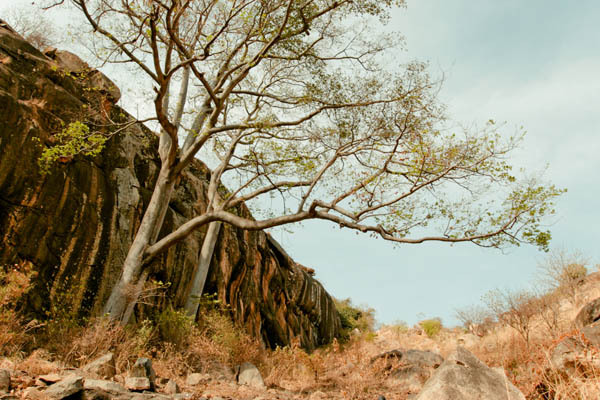 1358: Leave Jebel Lodge in the tiny little two door car, windows open to beat the heat. 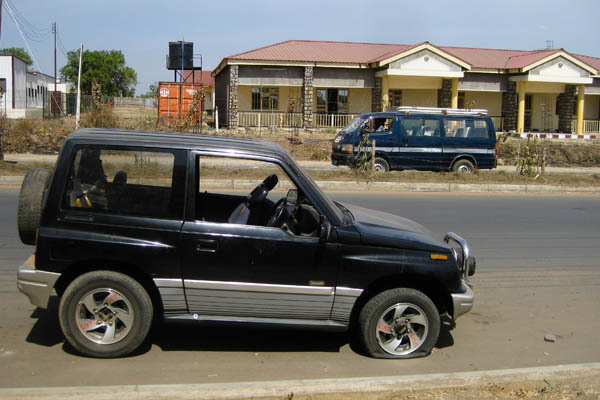 1423: The inevitable finally happens, on a main street near Dr John Garang Mausoleum: the problem tire suddenly goes completely flat. There are no tools in the car to put the spare tire on. 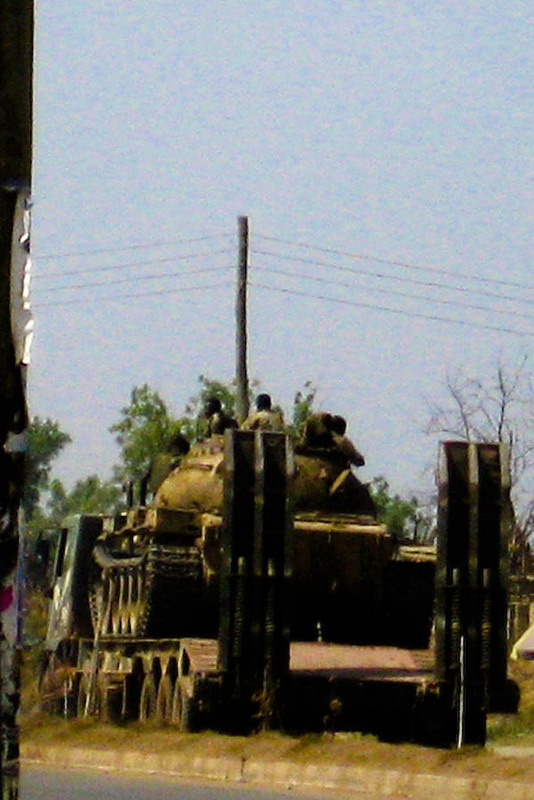 1439: While waiting for a friend to arrive with tools to change the tire, a huge flatbed truck rolls past with a tank on board. 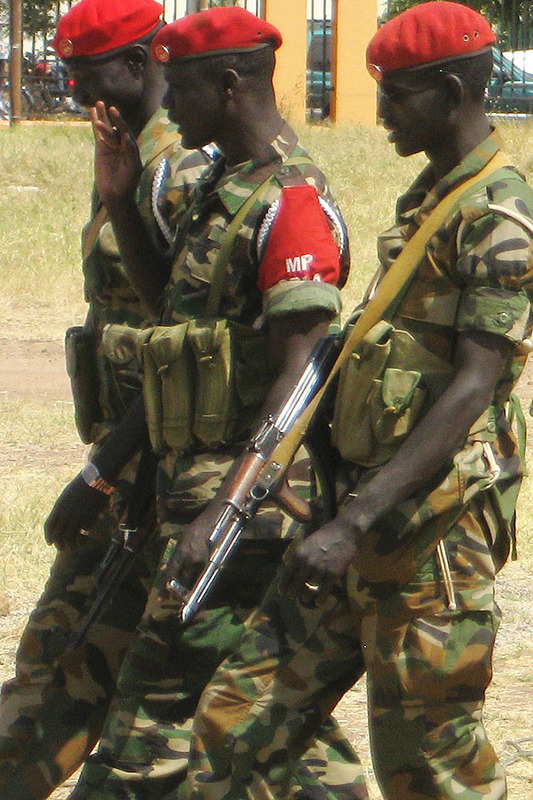 Atop the tank sit a bunch of young SPLA soldiers, chanting and fist-pumping in the air. Random. 1450: Tire changed, back in the car. 1304: Arrive home, take a nap. 1738: Leave home toward a friend’s compound for volleyball. 1844: While having a quiet beer at the bar between volleyball games, discover that the morning’s hibernating bear grunt from House 16 originated from the vocal box of a large Serbian man who does not like mornings, but is very friendly in the evenings (which is when we’re accustomed to seeing him at the bar). 2040: Return home after many games of volleyball and some good conversations with friends. 2355: Set alarm for what is guaranteed to be a tough Monday in the office. Get under mosquito net. Go to sleep. 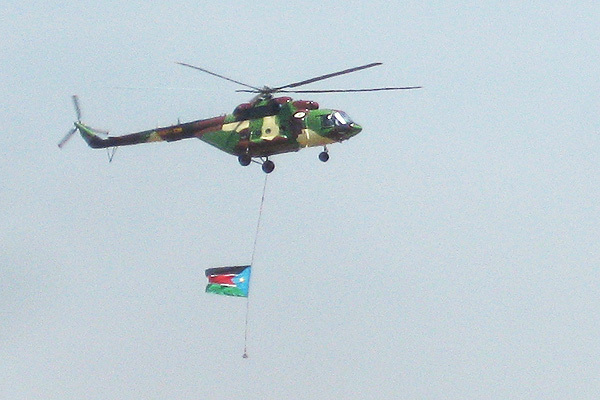 At just about noon yesterday (25 January 2011), two Mi17 helicopters slowly lifted from the tarmac at Juba Airport in South Sudan, each with a large South Sudan flag hanging below from a rope with a weight on the end. 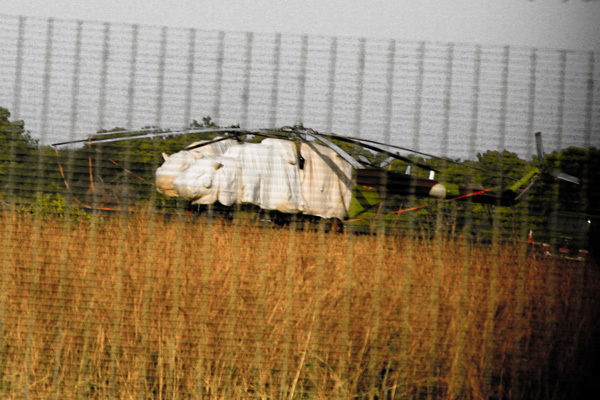 This was the very first flight of the Sudan People’s Air Force (SPAF), which has only just been created and so far consists of a whopping eight Russian-made helicopters (with two more to be delivered). 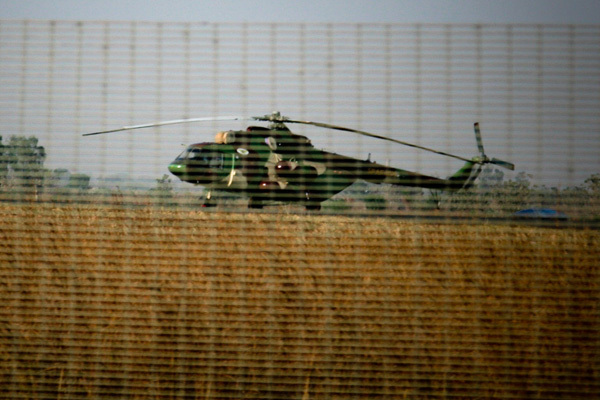 Prior to this, the SPLA has never had any kind of air force, so it’s kind of a big deal. For the South, this is a point of pride. 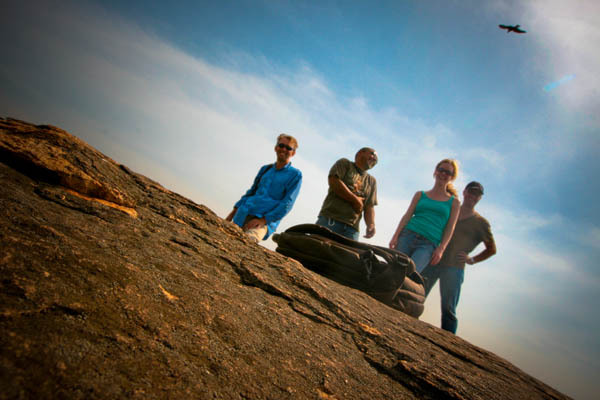 The helicopters flew a wide circle over Juba, and people everywhere pointed as they looked up to see their flag flying through the sky below the helicopters that had, for the past two weeks, sat idly at the airport doing little more than looking pretty. 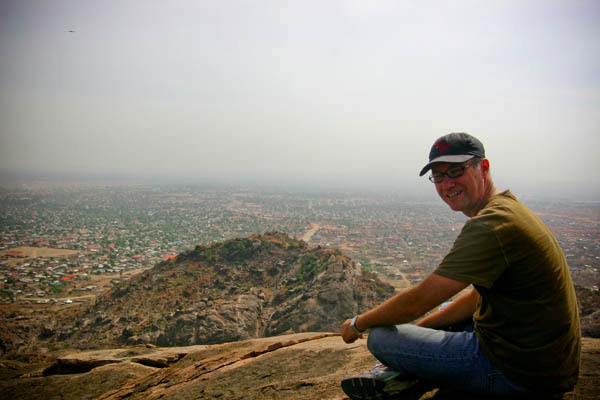 While a humanitarian worker should remain neutral and impartial to a great extent, it is at the same time difficult for me not to sympathise a bit with my South Sudanese colleagues whose faces light up with wide smiles when they talk of their impending independence and their pride in being South Sudanese. Who knows how all this will turn out, but for now it’s nice to see people so happy. 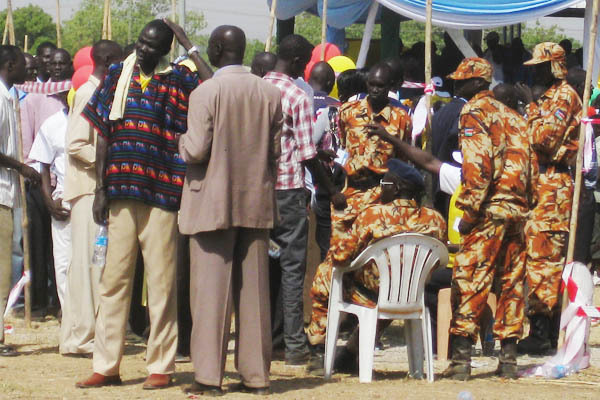 South Sudan’s Referendum on Independence: A Solution to Everything? 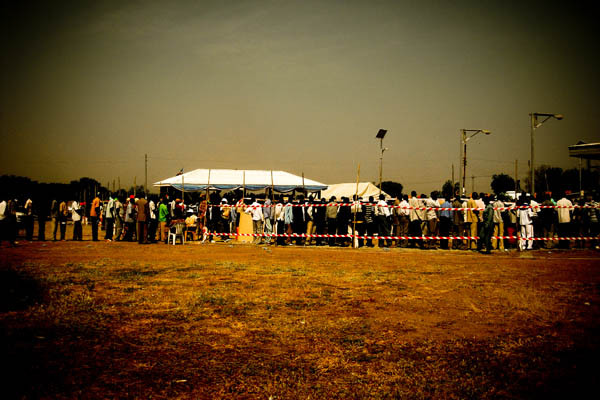 Today is January 9th, 2011: the first of seven days of voting in South Sudan’s referendum on secession from the North. 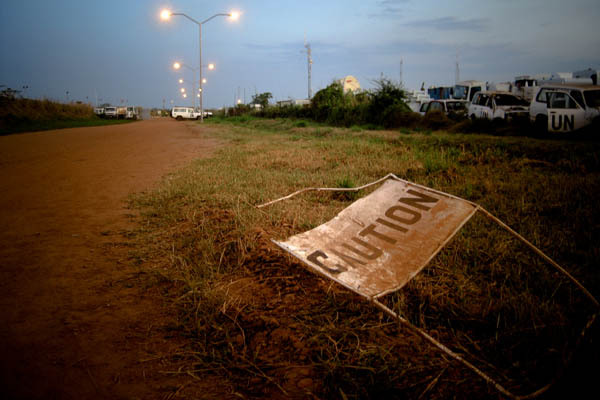 Effectively already self-ruling, South Sudan will most likely become the world’s newest country in July, six months after the referendum, as agreed in the 2005 Comprehensive Peace Agreement, provided that 60% of the registered voters turn out and vote for separation. 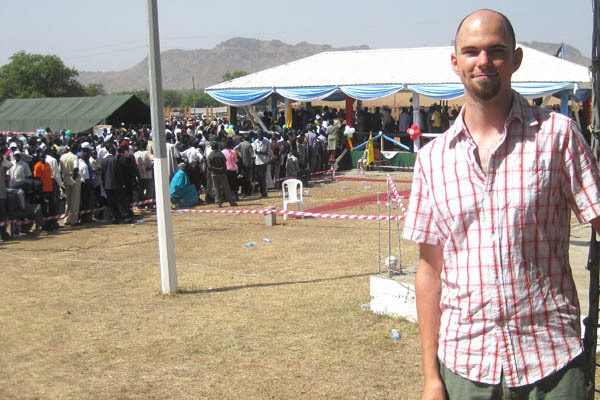 Back on January 4th, when I returned to Juba (capital of South Sudan, where I’ve been living since September 1st) from three weeks of leave in Canada, I saw President Omar Bashir land, spend some time on the airstrip, and leave in a motorcade. He was making his final attempt to sway voters to vote for unity with the North, and also promising to support the South even if they vote for independence, a statement most people here feel was a total lie. 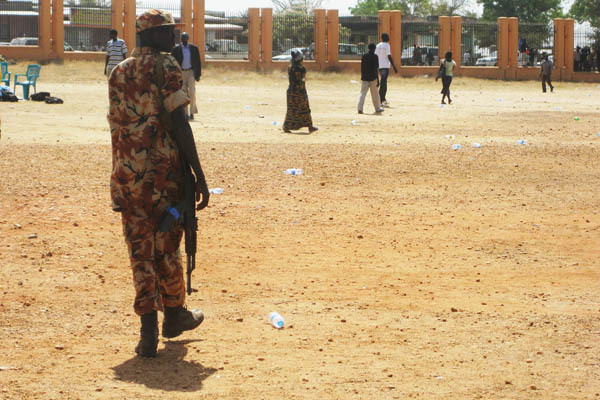 Things have remained calm here in Juba, despite earlier worries that the security situation might deteriorate as January 9th approached. Although the border with the North is seeing some problems, it looks like most of the South will remain stable for the moment. 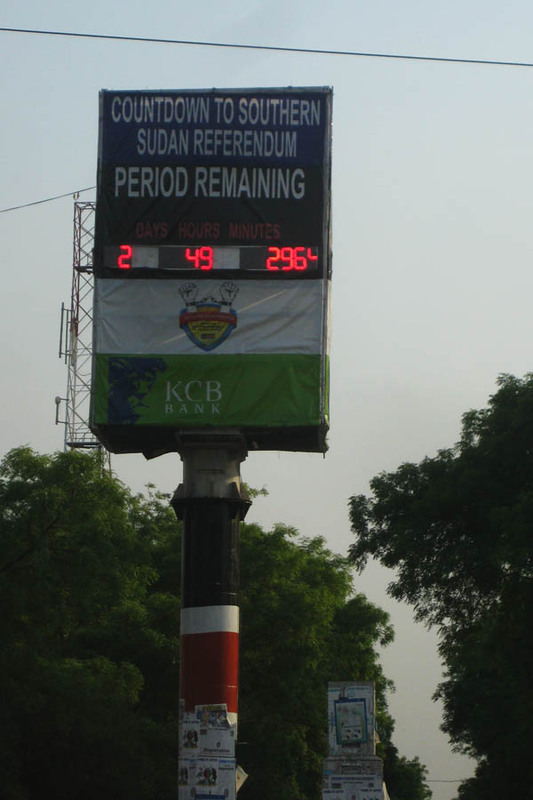 The digital countdown clock is somewhat symbolic of South Sudan’s present state of development: the clock was paid for by a Kenyan bank (the economy here is dominated by foreign-owned businesses), has suffered constant technical glitches and breakdowns since being installed in October (nearly everything in South Sudan seems to be dysfunctional to some extent), and was counting toward the great event of the referendum (seen as the culmination of a long struggle, an event that will completely change this country for the better). 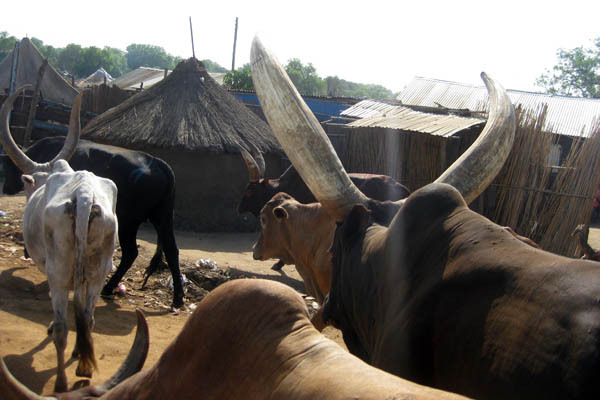 While South Sudan is seeing rapid development in some ways, especially in terms of infrastructure in urban areas like Juba, the norm in this country remains an agrarian one where livestock are often seen roaming the streets without any fear of the big Toyota LandCruisers trying to get from A to B (but never in a straight line). 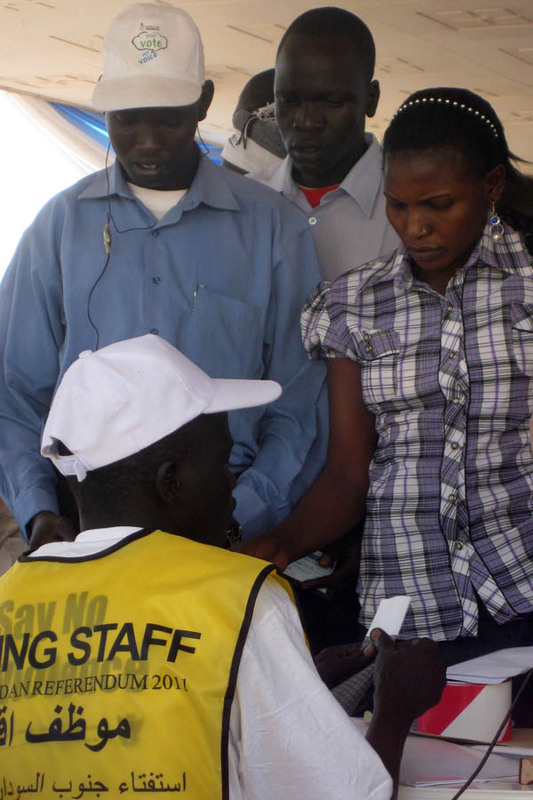 This morning I went with some colleagues to the largest polling station here in Juba. 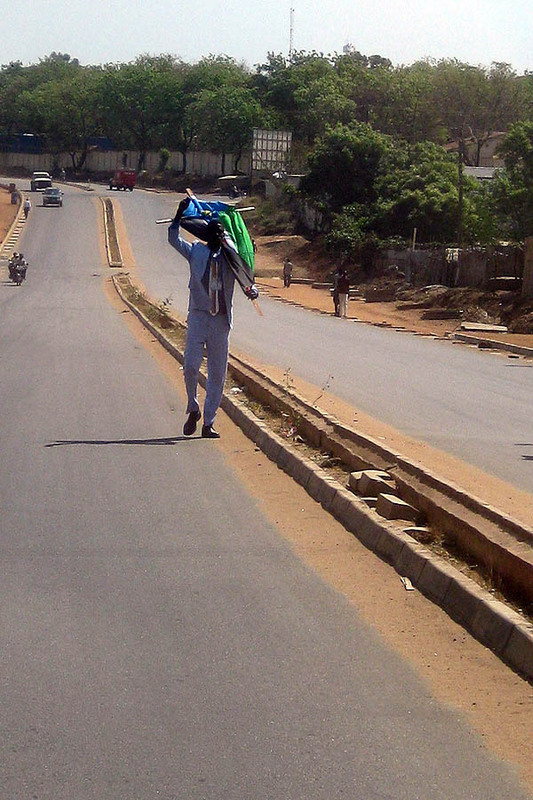 Along the Airport-Ministries Road, a man in a suit carried a cross around which he had wrapped the flag of South Sudan. 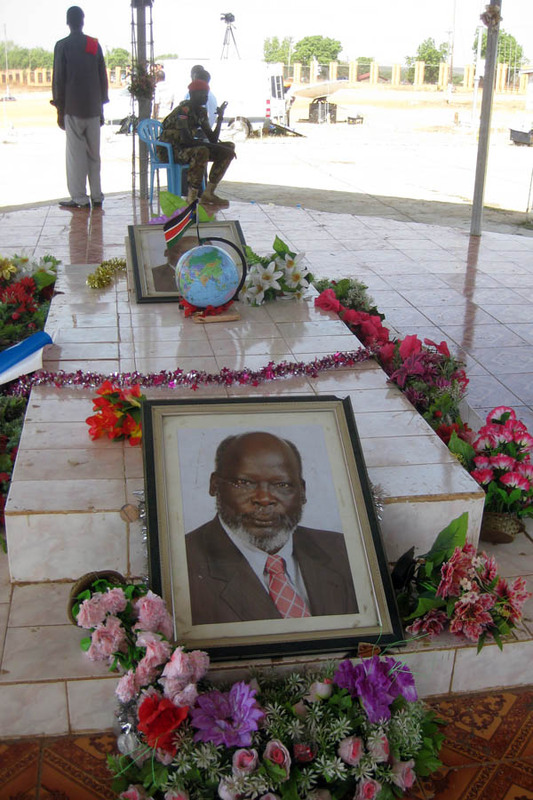 The largest polling site is at the Dr John Garang Mausoleum, where the biggest hero of the long South Sudan struggle was laid to rest after dying in a helicopter crash. The officials at the gate allowed us in, even though we’re neither elections observers nor journalists, and we were free to walk around the grounds and take photos of it all. I was really annoyed at myself for deciding to bring only my small point-and-shoot camera, and not the dSLR, as this turned out to be a rare opportunity to take photos very freely here in Juba. 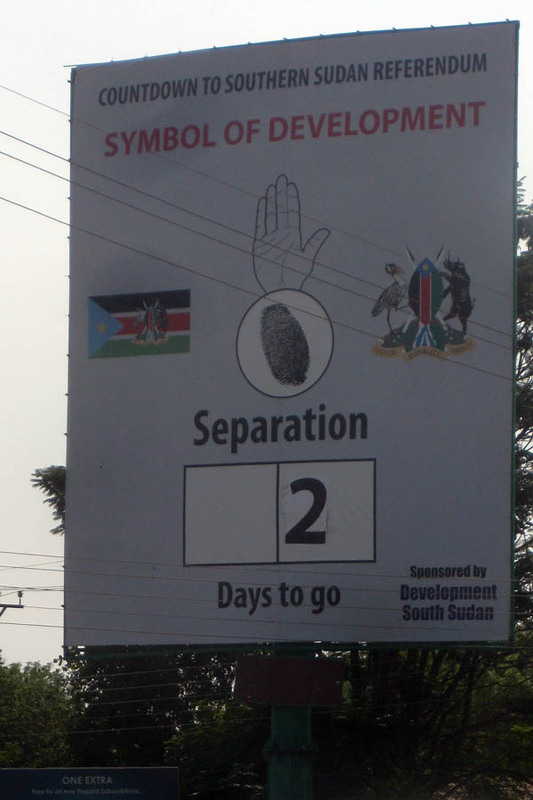 People in Juba remain in a happy, even festive, mood, but how long will this last? Six months from now, the South will almost certainly become an independent state, but what differences will the people of South Sudan really see in their day-to-day lives? Time and again in other countries, people have been led to believe that a change of government, or the adoption of democratic voting system, or the creation of an independent state, will solve all their problems and provide an opportunity to break with the past. 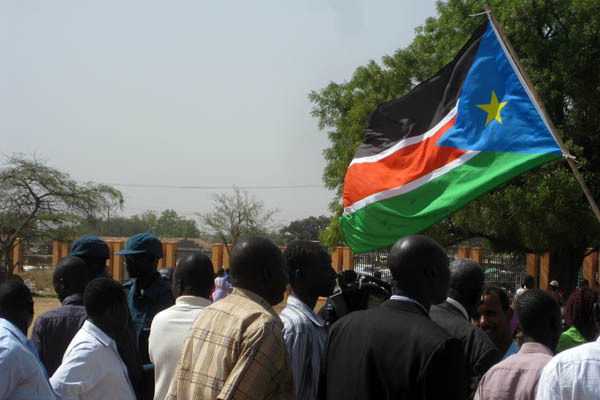 Here in South Sudan the statements echoed by politicians and citizens alike are all too familiar: independence will bring freedom, prosperity, etc., etc., etc. 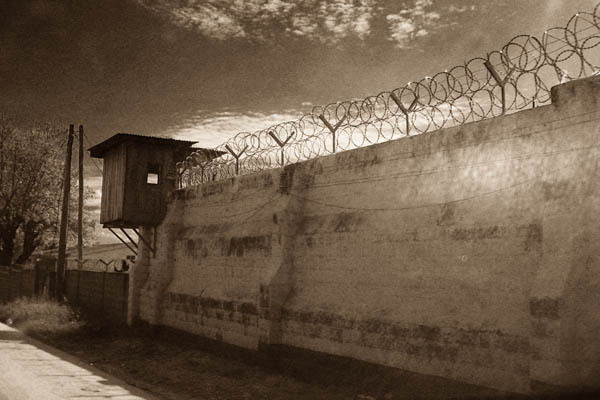 But will independence decrease the number of children in the police and military? 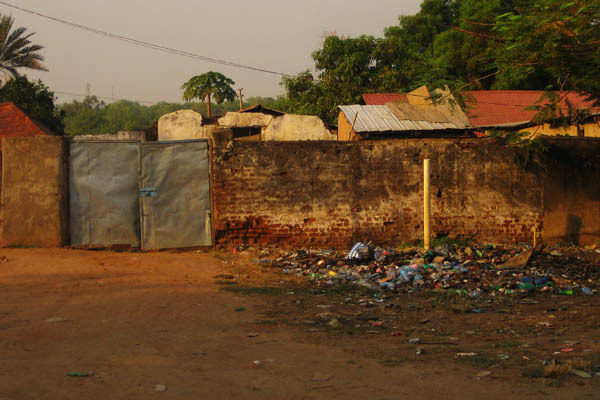 Will the new state of South Sudan change the attitude of South Sudanese toward their environment and develop systems to deal with the large quantities of trash that have begun collecting in even remote areas of the country? 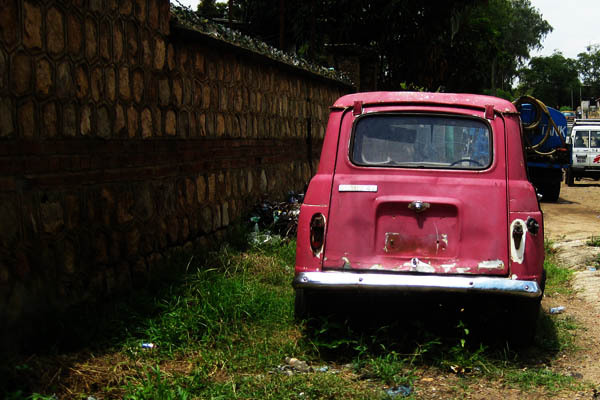 Will there be better public transport and more middle class citizens able to afford vehicles, rather than an elite few holding the keys to shiny luxury SUVs, while the carcasses of old cars remain a standard roadside landscape feature? 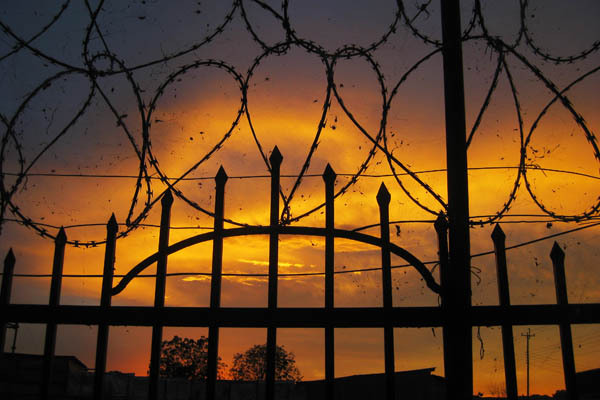 Will the situation in South Sudan improve so that there will be fewer poverty-driven criminal acts, and fewer people sent to jail? 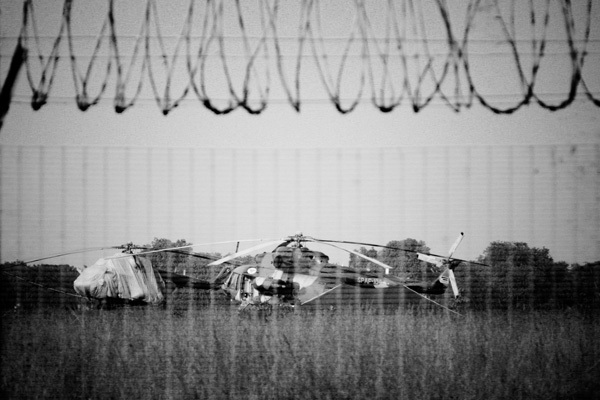 Will independence bring more security and stability to the average family, and decrease the market demand for barbed wire and razor wire? 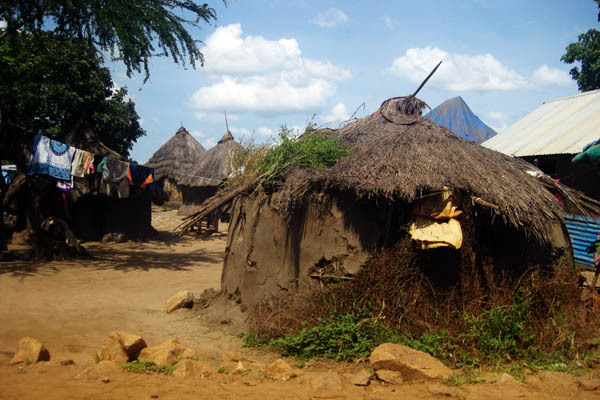 In six months, when independence becomes official, or in a year’s time, when the new state should be moving from a crawl to a walk, will South Sudanese find themselves living in the same difficult conditions or will they have better homes? 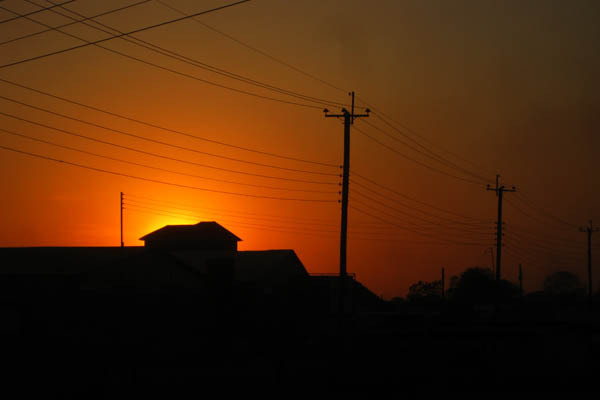 Will the average South Sudanese find himself walking to a shop to watch the big football match of his favourite English Premier League team, or will he be able to watch it in his own family home with city power lighting his house and powering his television? 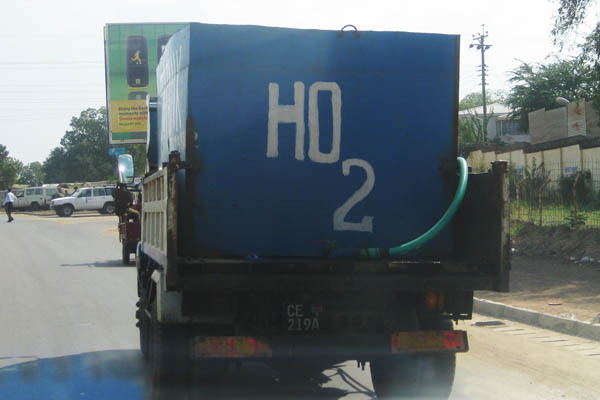 Will the unbelievably low literacy rate in South Sudan rise with independence, or will people continue to ignore the fact that trucks roll down the street supposedly selling hydroperoxyl (HO2) when they’re really selling water (H2O)? 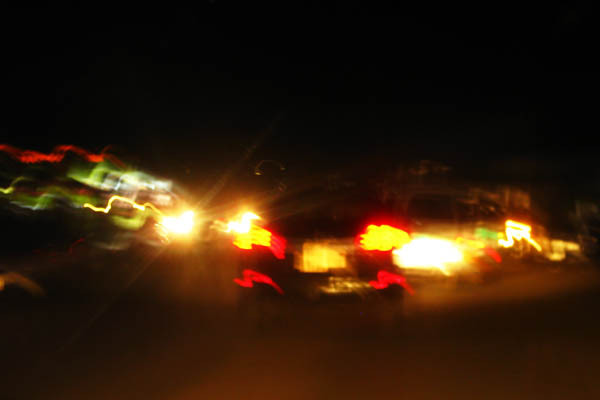 Will cases of drunk driving decrease after independence or will it continue as a normal practice among those who have the opportunity and ability to drive? 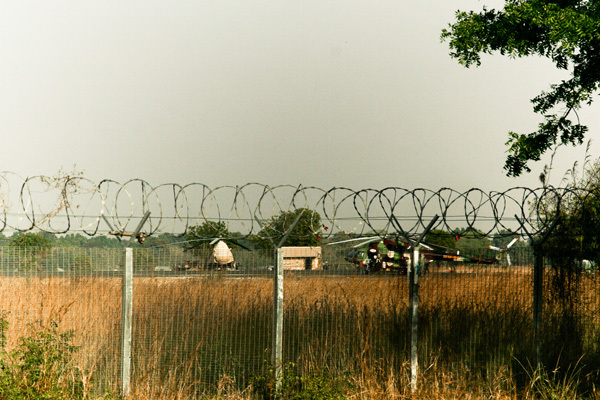 Will the big UN presence in South Sudan remain, or will the UN reduce its forces by its own choice or that of the government of the new state? 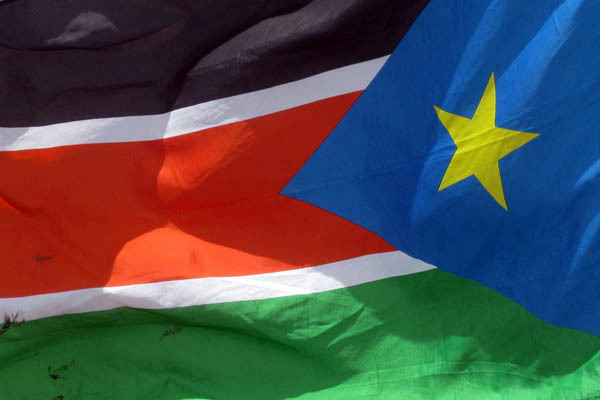 Will an independent South Sudan undergo development at an acceptable pace, gradually eliminating the need for the many international NGOs operating in the country? 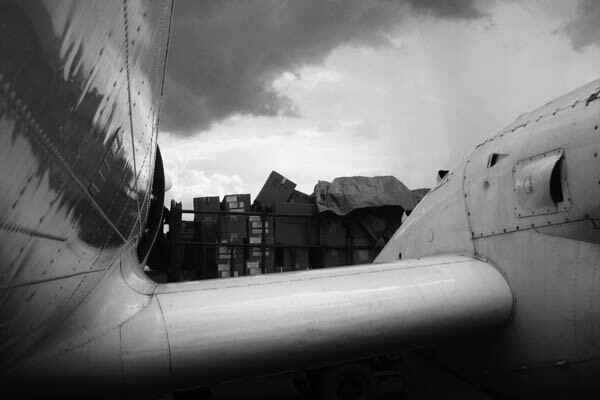 Or will these NGOs have to stay for many years to come, using money from foreign donors to import and transport all sorts of supplies to meet the needs of the population, such as this planeload of drugs I organised in November which was paid for by the European Commission? It’s very interesting to be here in South Sudan at this time, to witness history in the making, but I can’t help thinking of what lies down the road for a country whose people hold such high expectations of what independence will bring them. While I agree that the South deserves to become an independent state, the crisis of expectations that probably lies in this country’s future may not see so many people smiling as I saw today. I’d be very happy to be proven wrong.